Have the best possible arrival and departure with help from VBT. We cover everything you need, from airfare and airport transfers to extra hotel nights and breakfast. 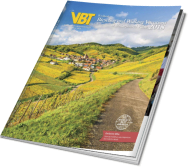 VBT is committed to providing unsurpassed value to our guests across the board. We handle everything from low-cost upgrades to business class seating and custom air options for extra time abroad, so you can have your vacation your way. Take advantage of our Air Package and save even more on your vacation. Round-trip international airfare from most major US cities and select Canadian gateways. * Air fuel surcharges and government taxes & fees are included. All overseas airport and hotel transfers with meet-and-greet services with a VBT representative. Up to two extra nights of accommodations in convenient 3- and 4- star hotels. Daily breakfasts that will fuel you for a day of exploring. Save more on airfare by combining two or more back-to-back VBT vacations. You’ll also enjoy convenience and peace of mind—all the logistics are handled by our expert tour consultants . With your air travel and transfers all taken care of, you’ll have more time to settle in, relax, and explore before the official start of your VBT vacation. *Please Note: Don’t see your preferred departure city? Contact a VBT tour consultant at 800.245.3868 to learn more about departing from an airport near you. Please be advised: Due to new U.S. Transportation Security Administration (TSA) mandates, customers making a reservation are required to provide their Secure Flight passenger information exactly as it appears on the government-issued identification card they plan to use when traveling. *We strongly recommend having your passport handy when you make your reservation. Customize your air itinerary and spend more time abroad. With custom air, you have the ability to fly overseas early, extend your return date home, and even fly home from a different city than where the tour normally ends. There is a $100 per person administrative fee for custom air and there could be additional airfare costs depending on your request. Enjoy more comfort and convenience with a business class upgrade. When you travel business class, you’ll be better rested and more prepared for the start of your active vacation. And our competitive business class rates make it a better value.. Call your VBT tour consultants today to upgrade your vacation! Note: business class seating is subject to availability. Airlines do not allow pre-selection of seats on all flights. All seat requests are honored at the discretion of the airlines and are subject to change by the airlines at any time. If VBT is not able to select a seat when reserving the flight, you can contact the airline directly, once the tickets have been issued, to see if seats can be requested. VBT does not charge a fee for seat selection, but some airlines do, so if you request seats from the airline directly, there may be a fee. The average seat selection fee is $35 per each flight including connecting flights. Click here to view baggage fees that may apply to your flight.